Weavers are not usually considered as wetland birds, yet several species are dependant on wetlands for at least the breeding part of their life-cycle. 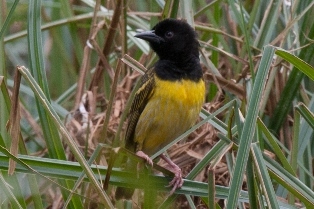 Many weaver species may nest over water but also breed away from water, and these species are not included here. A high proportion of nests in reeds versus trees is a good guide to how important wetlands are for particular species (see here), but this does not always work. The Holub's Golden Weaver, for instance, usually breeds in trees, but invariably trees that are next to rivers or other wetlands.